Our brand new Spring 2015 catalogue is now available, bursting with a wide range of flower and vegetable plants plus bulbs and some really useful seasonal garden equipment. If you have bought from us in the last year then a catalogue will be sent to you automatically otherwise you can request a catalogue or take a look online where all the products are detailed. The Dobies 2015 range includes trusted favourite varieties but also some exciting new ones. To whet your appetite we thought we’d give you a quick introduction to some of the new vegetable plants on offer. Why stick just with the old varieties when you could include some of the new ones that are so much improved? Tomato Crimson Crush – the world’s first fully blight resistant tomato combined with a really great taste. Tomato F1 Aviditas – a lovely mini-plum tomato that came tops in our taste trial of 206 different varieties. New and Exclusive to us! Tomato Indigo Rose/White Cherry – the first grafted tomato plant bearing black and white fruits. Traffic Light Grafted Pepper – super sweet and very productive red and orange snack peppers grafted onto the same rootstock. Cucumber F1 Carmen – a superb all-female cucumber producing long straight fruits. Cucumber F1 Bella – highly reliable, all-female and resistant to powdery mildew. Onion Esther – a very early yellow onion with a mild taste. Even earlier than top seller Sturon! Onion Red Arrow – round red bulbs produced 4-5 weeks earlier than other early varieties such as Red Champion. Onion Stuttgarter – sweet and mild and perfect for storing. Onion Rose de Roscoff – fruity sweet taste with a slight sharpness. Stores very well. Garlic Edenrose – a hardneck high yielding variety producing strongly flavoured rose skinned cloves. Click here for details. Mangetout Golden Sweet – sweet tasting golden-yellow pods. Mangetout Shiraz – fabulous purple pods and pretty bicoloured flowers. Tomato F1 Flamingo – our favourite cherry tomato in our trial of over 500 varieties. Tomato F1 Orange Paruche – succulent, sweet and full of flavour these brilliant orange fruits are crack resistant. Tomato Sweet Aperitif – bite size cherry red tomatoes with a sweet yet tangy flavour. 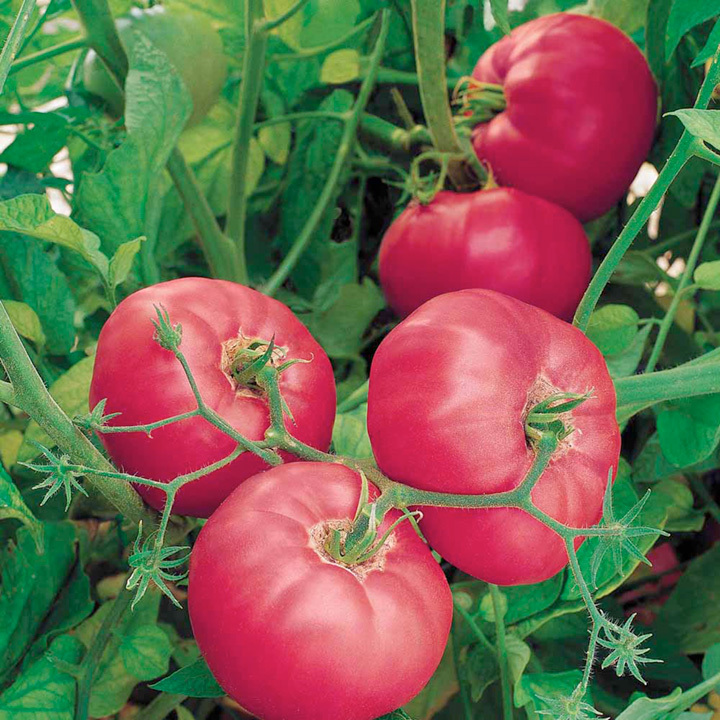 Tomato F1 Brandy Boy – similar to Brandywine but even better this new hybrid produces masses of pink beefsteak tomatoes packed with a rich flavour. Tomato Borghese – high yields of small plum-shaped fruit perfect for drying in either the sun or the oven. Click here for details. Remember – the above is just a taster. We’ve also got some really interesting new varieties of potato, including sweet potatoes, plus loads of glorious flowers. Check out our new catalogue or website for details. Here at Dobies of Devon we have customers who are new to gardening together with those who have many years of skill and experience. We really enjoy receiving letters and emails from all of our customers either asking for advice or giving feedback on our products with many reporting on successes that they’ve experienced at shows during the year. It’s surprising what will trigger a garden memory, or where an early love of gardening acquired in childhood may lead. For me, it was helping my grandmother deadhead annuals during the war (WWII); and ditto for my great aunt in the 1950s. I learned so much about plants when on my knees – and I wasn’t praying! The gardening bug did not really hit me until years later, and now I have so many memories that they jostle each other for space in my elderly brain. Not a day goes by but something, somewhere, will trigger a gardening memory from the past.